As we hinted at in part one, getting the static sag right is the basic starting point for getting everything else set correctly. And as you set sag you may well come across some other basic problems that you’ll never find otherwise. Static sag is set with the bike under its own weight, and there are a couple of other tests that go with it. 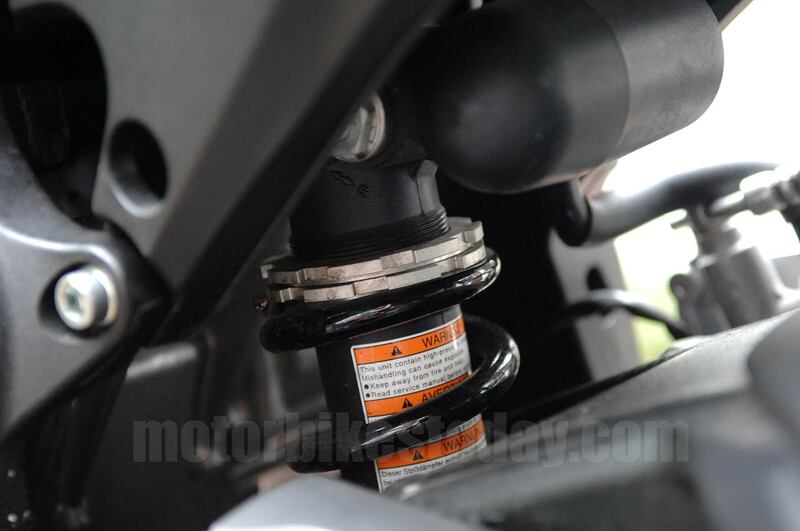 There’s the same test with rider and normal load in place, sometimes known as the One G Test, and a measurement of how much suspension travel is actually used in action. It’s quite important to remember that this is a process. It has to flow in the right order, and it has to flow from end to end. miss a step and the process will not work. Sadly there really aren’t any shortcuts here. So what exactly is static sag? Well, the dictionary tells us that static refers to a body that is at rest or motionless, while sag implies a drooping or loosely hanging item. So static sag, as regards suspension anyway, refers to the amount that the suspension droops (or, indeed, drops) when there’s no other load on it. And to make things easy, and hard as well as you’ll see, we will work on a simple basis. If the bike had no weight then the suspension would be fully extended. Agreed? Good. 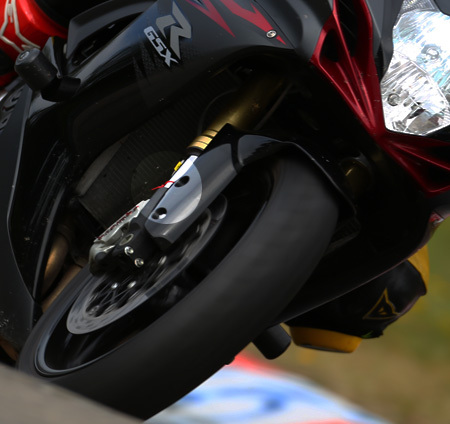 Then static sag is the amount of movement used between fully extended suspension and suspension supporting the weight of the bike. Now the exact settings for static sag will vary between bikes, and even between riders, but there are some reasonably solid guidelines we can use, at least to get us into the right ballpark. But before we do anything else I need to remind you of the caveat. While this article is written with the best intentions, anything you do is your responsibility alone, so if you muck up your handling or drop the bike while measuring sag, it's down to you. OK, on with the show. How to measure static sag is quite easy. You will need at least two people, though. Working with your assistant, make sure you both understand the measuring points you are going to use. Get the wheels off the ground, one at a time. If you only have a sidestand and a lot of confidence then you can do it easily enough, balancing forward then backward and leaning the bike towards you, making the stand act as a pivot. 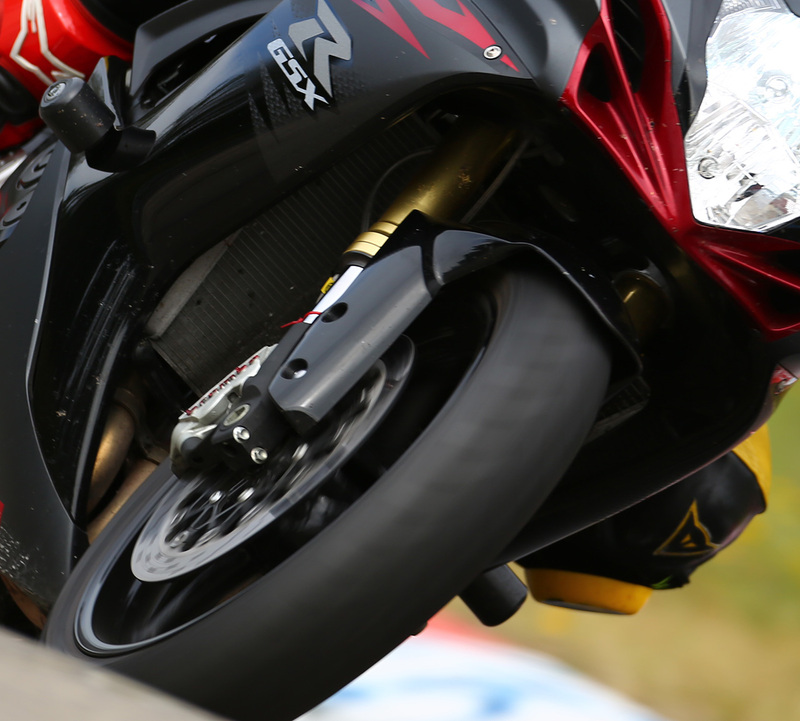 KEEP THE FRONT BRAKE ON when you’re working on the back wheel. If you have a centrestand it’s easier, of course. Otherwise you need a couple more people who can do some lifting. Get the wheels off the ground, one at a time, and measure between your agreed points now that the suspension is fully extended. Once the wheels are back on the ground, bounce the bike up and down a couple of times to make sure it’s settled, then hold it upright so that all the weight is straight down through the wheels. Do NOT sit on the bike at this point. Measure those agreed distances again. The difference between the first and second measurements is your static sag. Now while individual bikes will vary, you generally should expect your rear sag to be up to 10mm, while the front should be between 20mm and 30mm. If your main focus is track riding then you’ll be looking to be on the firmer side of that range. On the road, probably the softer side. As an example, my road riding biased GSX-R 750 has 26mm of front sag and 10mm at the back as it came out of the factory. But in the most part, unless something has gone horribly wrong, our bikes spend little or no time moving without us on board. So it’s more useful in real terms to get the sag when the bike is loaded. That means, at the very least, having you on board. If you always carry a pillion, or luggage, or whatever then put them on too. This is the One G Test, and it’s actually not that hard. But you need more help than before. In fact you need a minimum of three people you can rely on. You’ve already got the unloaded measurements, so as long as you are measuring to the same points then you can use them. It’s best if your measurer is the same person as before so they know where those points are. Otherwise get the measurements again as you did for the static sag. We’ll assume it’s just you normally on the bike. Don’t do this in shorts and tee shirt with an empty fuel tank. There’s no need to be in full kit, but at least get vaguely close to riding weight and have at least half a tank on board as well, as there’s probably around a quarter of your weight in liquids when the bike is fully wet, and that’ll make a difference. Now get on the bike and get the two assistants who aren’t measuring to balance it while you put your feet on the pegs and get into your normal riding position. They need to be just balancing, though, not lifting and not pushing down. Bounce up and down a few times (let them know you’re doing it first as taking them by surprise could be embarrassing, potentially injurious and expensive) to be sure the suspension has settled. And then get your measurer to do their stuff again. The difference between the two measurements will be your One G, or loaded, static sag. So now the basic suspension is set correctly we need to see how it behaves on the move. We’re still only looking at the spring, the basic firmness of the suspension, not the damping. So what we need to do is see how far it moves during your normal riding. Note what I said there. During your normal riding. So if you usually go honing around the countryside with your hair on fire and your bum in the air, a gentle bimble around the block isn’t going to tell us much. This is actually quite easy to do. You’ll need a couple of cable ties, sized to go around your fork leg and centre rod on the rear shock. To clarify, on the forks the cable tie needs to go around the shiny bit that disappears inside the wider tube, and it needs to rest against the dust seal on the wider tube. It needs to be fairly tight – loose enough to move when the dust seal pushes it, tight enough to stay where it ends up. The rear shock may well be hard, perhaps even impossible, to reach. Or, indeed, to see what happens anyway. You may want to see how things feel and how the front measures up before deciding what to do. So attach your cable tie to one of your fork legs and go for a reasonable ride. Long as you like – this is setup time so use that as an excuse and go enjoy yourself. When you get back take a look at your cable tie. It should have been pushed almost to the other end of the suspension travel. If it’s jammed hard against the end of the tube then the suspension is probably too soft. If it’s only half way along the range of travel then either you weren’t trying hard enough or the suspension is too hard. 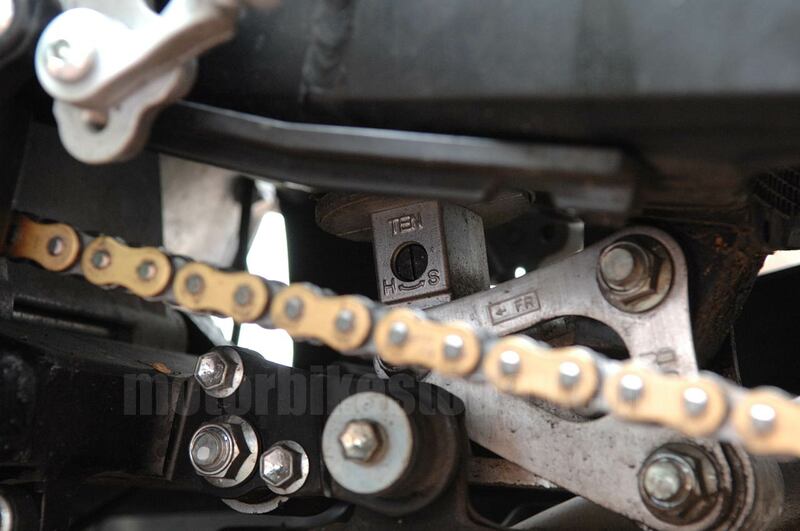 If you find that, once you have made adjustments to the preload to make sure that you’re using the right amount of your suspension, you can’t keep all three things – suspension travel, static sag and loaded sag – all within acceptable range, then you may need to look at changing your spring weights. For example, imagine that you have the stationary settings right but that you’re not using very much fork travel at all. That might suggest that your style of riding means you would be better with a lighter spring weight and a bit more preload. Set the sag with the preload and have the lighter spring give you more suspension movement which will give you better stability under braking and also make the ride more comfortable.